Like Mozilla, I rely on all of the contributors to this Open Source project for the supplied program code and development of new versions. The Mozilla Corporation didn't program firefox, the community did. This also means that, like Mozilla, I retain the rights to the Pale Moon project name, graphics and logo; they may not be used elsewhere without prior permission, and only in relation to this browser. * Specifically optimized for current processors. It makes full use of the enhanced instruction sets of newer CPUs - as a result, this browser will not run on older systems. * Support for Scalable Vector Graphics (SVG) and Canvas, both vector-based types of graphics. * Support for Firefox Extensions and Themes. * CSS Downloadable Font support (including WOFF). * HTML5 and advanced DOM support. * 100% Firefox Sourced! This means you get the reliability and stability of the Firefox browser, and the wide array of Firefox options and features. * Significant speed increases for scripting and page rendering compared to Firefox. 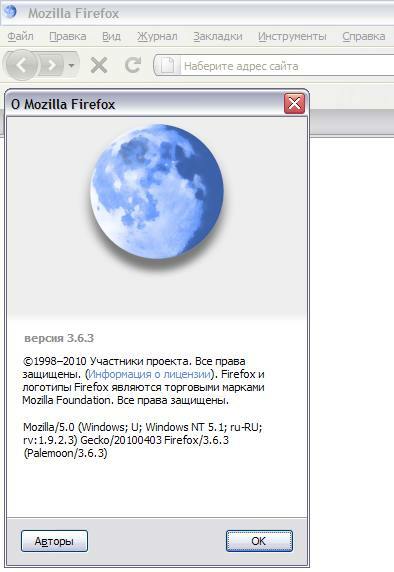 * There have been multiple reports of certain web sites being displayed correctly in Pale Moon, that were problematic in Firefox - I have not been able to personally confirm this. * ActiveX and ActiveX scripting. ActiveX is specific to Microsoft's Internet Explorer, and is not natively supported by (any) Firefox builds. There are some extensions that enable ActiveX components and scripts to run in Firefox on Windows, which will, therefore, not run in Pale Moon. This is a security consideration more than a speed consideration. * Accessibility features. Most people, and certainly the people looking for speed optimized browsers, don't have a need for accessibility features. This cuts down some on the input complexity, and increases speed, but will, obviously, not be suitable for people who need these features. * Parental controls. Pale Moon aims to be a fast browser for general use, not a "secured family browser". The design impact of parental controls as introduced in Firefox 3.0 and later is significant, and has had serious implications for building the browser. As such, parental controls have been disabled. * A few miscellaneous things like the crashreporter and automatic updater, since they require server-side components that are not in place at palemoon.org. You will have to check manually if you have the latest version and update accordingly. И что, локали не ставятся? Pale Moon is released as a US-English browser, and there are no localized versions for other languages available. If you feel more comfortable with a different localization of the browser for menus and user interface, there is an option to change the elements of the browser interface to match your preferred language using a language pack. I have not personally tested these language packs and there may be problems with some of them. Use them at your own risk! 2. Identify the xpi file of your preferred language. You will need to know the common abbreviation of your desired language. If you see multiple xpi results for your preferred language, identify the one with the label of your region (e.g. es-MX for Spanish-Mexico). 3. Click the xpi file that corresponds to the language you want to install in the Firefox browser. If you get a warning bar at the top, about the site wanting to install software on your computer, click the Allow button. Verify by clicking Install Now. 5. Restart the browser to put the language pack into effect. Please note that these language packs are for Firefox, and the texts in them will refer to the browser as "Firefox" instead of Pale Moon. This can't be helped, since the name is hardcoded in them. I don't really have the time to update all the language packs out there whenever there is a new release of the Firefox code to suit Pale Moon. Сторонние, оптимизированные под процессоры сборки, доступны уже много-много лет. ... И вообще, это наша всеми любимая девочка Леска (большой сторонник всего нового) общую волну подняла! Лично я уже скачал, русифицировал portable-вариант, вечером попробую поставить туда весь набор дополнений из Rosenfox Portable, а также внесу свои настройки в about:config. Если будет реальное преимущество - так почему бы и не порадовать такой сборкой пользователей? Это разве плохо? Под процессор и под ОС — это разные оптимизации. Никаких особых преимуществ перед обычным 3.6.3 не заметил.Возможно,что на нормальном широкополосном подключении и заметно,у меня 64кбит/с. Из суеверных соображений с недоверием отношусь ко всякого рода сборкам. As such, parental controls have been disabled. А разве в Firefox есть родительский контроль? Что же они в таком случае отключили? Возможно они имели в виду БД некошерных сайтов - два чекбокса по умолчанию отключены. Но не уверен. Моя хорошая, только без паники! Intel(R) Pentium(R) D CPU 3.00GHz - у меня. Неа... под Athlon не нужно. Это Вы параноик?! ... Нет, это - Я ПАРАНОИК! вот этот в анимэ-смайликах почему-то определяется как :* - "поцелуй"
Все присутствующие, наверное, знают этот центральный переговорный пункт на проспекте Калинина (новое название его уже не помню)... Второй этаж, маленькая душная телефонная кабинка. Большая очередь... Из кабинки доносятся какие-то непонятные возгласы, крики. Толпа терпеливо ждет полчаса, час, потом народ начинает стучать в двери. Оттуда высовывается голова с характерным профилем, взъерошенной шевелюрой и недоуменно говорит: "Послушайте, но когда ВЫ(!) воевали, МЫ вам мешали?!" Леска а если галочку снять ? ну это вариант конечно,но само по себе поведение-то неправильное. Тема перенесена из форума «Программы и ОС» в форум «K-Meleon/Flock/Другие Gecko-браузеры».